There are a lot of LCN Door Closer applications out there. But with a little background, and some knowledge it is easy. The story of the LCN Door Closer starts in 1880, when Louis C. Norton started the Norton Door Check company. It was one of the first door closers made, and was very bulky. In the 1920’s Norton sold his company, which went on to be called Norton Door Controls. After the legal 7 year buyout agreement, he started LCN, which were his initials. Small story, but interesting none the less. A LCN Door Closer is supposed to control a door through the opening and closing process. I like to think of it in terms of energy. When the door is closed the closer has no energy, when it is fully open, it has its maximum amount of energy. When opening the door the energy is transferred from you to the door closer spring. When the door is closing it has to dissipate that maximum energy so it does not slam shut, that energy is transferred to the hydraulic fluid by being forced through valve, turn the energy in to pressure and then heat. A LCN Door Closer will control the process like not other door closer made. During the opening process the function of the door closer is to allow the door to open as easily as possible, except at the end were back check will kick in. 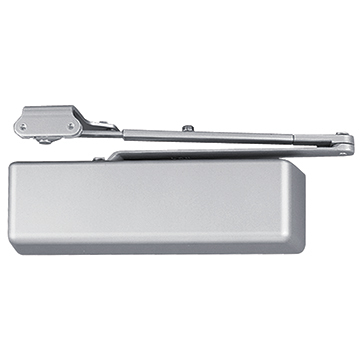 Back Check cushions the opening swing to prevent the door from hitting the stop with excess speed or force, all LCN Door Closers have Back Check. During the closing process the closer will maintain a uniform speed until the last few degrees of closing, the latching speed. There are two types of the LCN Door Closer, one is called universal and the order is called application specific. A universal closer will work on a left or right hand door, along with the ability to be mounted on the push (parallel arm), pull (regular arm) or top jamb. For an application specific closer you have to specify the hand and type of mounting. There are benefits and draw backs on each of them. The benefit of an application specific LCN Door Closer is they are usually more heavy duty, easier to adjust, and control the door better. With an application specific closer the engineers at LCN only have to account for forces in one direction. In a universal door closer you have to account for the forces in both directions. The forces on the application specific closer also apply to the door closer arm, again it is the same story with the forces in one direction. The draw back to application specific is you need to know the hand and the type of mounting you are using. Another issue is in larger buildings, were you have to stock extra closers, you will have to stock the different hands and mounting types for back ups. We this being said, application specific closers are recommended for institutional facilities. The benefit of universal closers are for larger buildings. You only need to stock one closer, because one closer will work on all doors. Universal closers have been around for about 50 years, and the gap in durability to the application specific closers has been dropping quickly. Another consideration for a LCN Door Closer is the amount of room on the door or door frame you have to mount it. 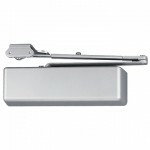 We have narrow style and standard door closers. The narrow style is for aluminum framed glass storefront doors, but they can be used on any door. Narrow style door closers are usually designed to be installed on frames as narrow as 1-3/7″. 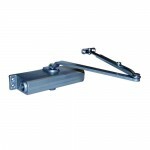 Narrow style door closers are usually the least expensive, also. LCN offers the 1000 line closers for these applications. In the 1000 line we have the 1260, and 1460, which are the most heavy duty narrow line closers out there. The 1260 and 1460 are universal closers. The LCN Door Closer 4000 line are the standard line closers. These closers are larger, but are much more heavy duty. We have the 4011, 4021, 4031, 4040XP and 4111 just to name a few. The 4011, 4021 and 4111 are application specific. The 4031 and 4040XP are universal closers. The LCN Door Closer we have talked about all have the ability to use different arms. LCN makes arms for all different applications and that will be talked about at a later time. If you have any questions on the LCN Door Closer, please drop us a comment or visit our website. We have access to all of the arms, covers and screws they offer, along with all of the template information at our finger tips.